If you are looking for a skilled and reputable dentist that offers Sedation Dentistry, Soft Touch Dentistry is your answer. We are a family dental practice that makes your comfort our priority. With a full range of dental care services in general, restorative and cosmetic dentistry, we can handle any aspect of your smile. Dr. Sarah Thompson is an experienced dentist who is uniquely licensed to perform both oral and IV sedation dentistry, giving patients the best opportunity to receive top quality dental care in a warm, relaxing environment. For many, just the thought of needing a dentist creates anxiety and fear. This can even lead to someone avoiding necessary dental care. 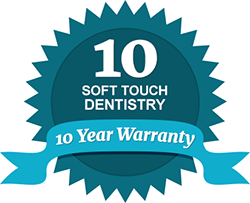 At Soft Touch Dentistry, our name describes our approach with each and every patient. Regardless of your dental needs, we can provide a pain-free solution to help you achieve the long-lasting, beautiful smile you deserve. First, we provide a very relaxed environment that allows our patients to reach a great level of comfort before we begin. We spend extra time answering questions and concerns prior to your procedure. Soft Touch Dentistry also provides relaxing amenities such as warm blankets, calming music and dark shades to help patients feel at ease. Second, we have the unique ability to offer both Oral Sedation (such as Nitrous Oxide) and IV Sedation dentistry. Whether you need wisdom teeth removal or a root canal, we make your experience as painless and pleasant as possible. Dr. Sarah Thompson is a licensed IV sedation dentist. She makes up less than 5% of all dentists in American and just 1% of dentists in the world. Our practice offers various levels of sedation to accommodate each patient’s specific level of discomfort or fear. We meet the highest safety guidelines with regard to our doctor, our dental assistants and our facility. Third, Dr. Thompson and her assistants are highly trained and experienced in using the latest modern dental techniques. This helps us provide a high level of efficiency, patient comfort and patient satisfaction at all times. Contact our family dental practice to schedule a free consultation and learn more about our full sleep dentistry options. If you are putting off an important dental procedure or cosmetic smile enhancement because of fear and anxiety, let us help you with sedation dentistry. We accept most dental insurance providers and offer flexible financing for your benefit.